Mendocino weather doesn't vary much. The cool ocean breezes, keep the average daily high in the 60's during the summer months. The winter daytime temps are usually in the 50's to low 60's, cooler at night and if stormy (of course). As you go inland and into Mendocino's Wine Country, the daytime highs average in the 70's, up into the 90's in the summertime. WINTER is crisp, with an occasional storm. It's amazing to be here after a good storm blows through; the sun shines, the birds sing and the ocean dances for you! SPRING brings perfect kite flying days with an occasional shower to water the incredible flowers you'll see everywhere. SUMMER - Ahh, the most popular time of year! Mostly because kids are out of school and "IT'S ALWAYS COOL IN MENDOCINO!" FALL is probably the most beautiful time of year (weather wise) it doesn't get any better than Indian summer conditions. Regardless of the season, It's always beautiful here! 2) COMFY and CASUAL - Bring comfy walking shoes - especially if you want to explore and hike! 3) COAT and/or WINDBREAKER WITH HOODS - They come in handy, especially for sunsets on the beach. 4) BINOCULARS - Great for whale watching! 5) YOUR FAVORITE BOOK, BATH SALTS - Or whatever relaxes you! 6) SWIM WEAR - For the hot tub, beach, or Spa. 9) NECESSITIES - Prescriptions, Reading Glasses, Toiletries, Sun Block, Sun Glasses - etc. TIP: If you can, Try to stay at least three nights. It takes a while to unwind from your busy world to enjoy our relaxed pace. 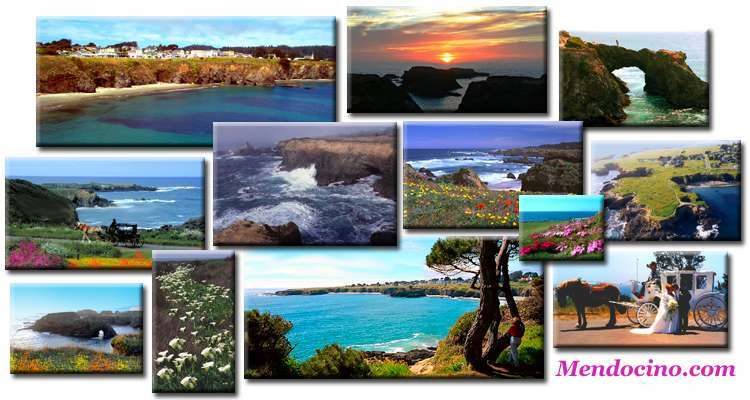 Mendocino.com supplies the Current readings for Mendocino weather. Please note: These readings relate to Mendocino Village on the coast. Some other weather services supply Ukiah's forecast (Much hotter in Summer) therefore not as accurate for the coast.